Few people look forward to their trips to the dentist, but perhaps for you it’s more than that. Even though most dental procedures are pain-free, you may have nightmares of dental drills or even feel stressed at the thought of having a basic hygiene appointment. You are not alone. According to Statistics Canada a whopping 40% of Canadians have some fear of going to the dentist. But not to worry – this is manageable! Read on to find out why so many people have a fear of the dentist, and to discover some tips that may help you conquer it. While many people blame their fear of the dentist on unfortunate childhood experiences or scary stories, there are usually deeper factors at play. Some behaviourists believe that there is a biological reason why some people feel uncomfortable at the thought of having their mouth examined. That reason may be that we unconsciously want to keep blockages, such as a dentist’s hand or dental equipment, out of our mouths in order to keep our breathing unobstructed. The fear, avoidance, and extreme anxiety one experiences while in the dental chair can be attributed to this natural desire to keep air passages clear and the basic fight or flight response. It has also been shown that people who strive to always be in control often have a difficult time at the dentist as they can feel helpless while reclining in the dental chair. Having someone take control over what happens in their mouth can be a very frightening situation for many people. 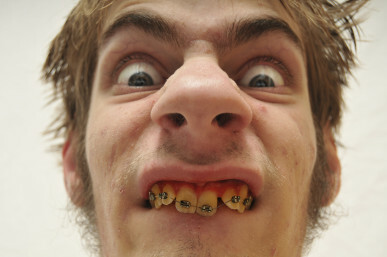 Another common reason for people’s fear of the dentist is that their fear was passed down from their parents. Often if parents are visibly afraid of the dentist and make a point of avoiding dental appointments, this behaviour can influence how children view the dentist. 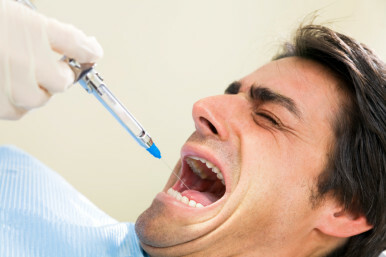 Those who are afraid of needles are also often afraid of going to the dentist as they automatically associate dentists with shot-administered anaesthesia, even though many dental procedures do not require any numbing at all. And of course those who have experienced abusive or otherwise unpleasant experiences while at the dentist are understandably more likely to experience stress and anxiety while at dental appointments. The old school of dentistry used to focus less on the comfort of the patient and more on the procedure. We have learned from those decades-old mistakes and it is standard practice to prioritize your comfort above all else. After all, we want you to come back to us next time you need a checkup or procedure! It may seem logical that those who fear the dentist keep their oral health in tip top shape so that they won’t have to ever make a dental appointment. However, studies have shown that because people who are afraid of the dentist do not get regular oral checkups, deep cleansing of the plaque and tartar that can’t be removed with a toothbrush alone is not done. This leads to larger oral issues such as tartar affecting gums and possibly leading to gum disease. Without regular checkups, other dental issues such as invasive wisdom tooth infections, tooth decay, and various forms of cancer will go untreated and undiagnosed. If you are someone who avoids dental visits and regular check ups, it is time to face your fears and have a chat with your dentist about your anxieties. This is the best way to decide on a treatment plan that ensures you are as comfortable as possible and can have regular checkups for the good your health. Sure, it sounds obvious, but many people don’t do it. Talking to your dentist is one of the most important steps to take when confronting your fear. Dental professionals can only ensure that you are comfortable and attempt to reduce your anxiety if they are aware of what your concerns are. It’s recommended that people who fear the dentist book a consultation with their dentist prior to having any examinations or procedures done. With the proper preparation, a patient can be made to understand what procedures will be performed and what to expect, greatly reducing their anxiety levels. If you are someone who craves control, talking with your dentist about procedures ahead of time may satisfy that need by giving you the chance to voice any concerns and make any modifications, should you need to. A common request is that the dental chair not be tilted back so far and instead the patient can be seated in a more controlled upright position. Give it a shot yourself next time you see the dentist. You may be surprised how happy they are to accommodate you. Some people find it extremely comforting to have a friendly face in the room while they are being orally examined or while having a dental procedure done. Bringing a friend or family member can be very calming for some people, making all the difference in the world between a stressful experience and a carefree one. Be sure to discuss with your dentist beforehand if they are fine with another person being in the room. Just the simple act of asking may be enough to bolster your confidence to a new level. If part of the reason why you dislike going to the dentist is the dentist themself, it is perfectly fine to say so and to find one who better suits your needs. Try not to be shy about this; you have every right to ensure that you’re comfortable. Switching dentists can be a source of anxiety for some, but keep in mind that it is best for both the dentist and the patient that the patient is satisfied with their care. We hope that these tips help you to find the courage to take on your fears of the dentist. Doing so will not only help you to overcome an emotional hurdle but will massively benefit your overall health. Your smile will thank you.